Liam Dawson cuts for Hampshire against Yorkshire in the County Championship. Hampshire's director of cricket Giles White insists his side still have a chance of avoiding relegation. Champions Yorkshire left Hampshire on the brink of an immediate return to Division Two after reaching 305-5 to win by five wickets on Thursday. 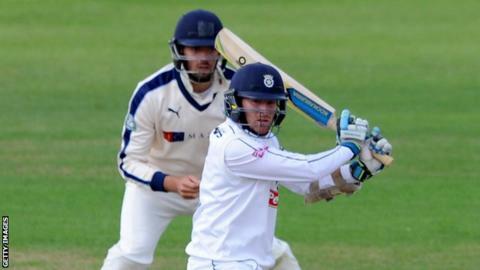 Hampshire must win their final match at Nottinghamshire next week and then hope rivals Sussex and Somerset falter. "It is not dead and buried but we would like it to be totally in our hands," White told BBC Radio Solent. If Sussex avoid defeat against Yorkshire and take at least nine points, and Somerset earn at least seven against Warwickshire, Hampshire will be relegated regardless of their own result. "We knew that going up to Trent Bridge we were going to have to win and Sussex are going to have to lose, but they are going to the champions at home," White said. The Hants boss admitted his team had found the step up to the top flight tricky after winning the Division Two title last season, with only three victories recorded this term. "Credit to Yorkshire because (Jack) Leaning and (Andrew) Gale played magnificently well who got them into a position it was difficult to lose from," added White. "There are a lot of good teams and it was new to us but we have seen that this side can compete with the very best teams. "Against Yorkshire we did not have the best hand to play and they realised we were under pressure to win."